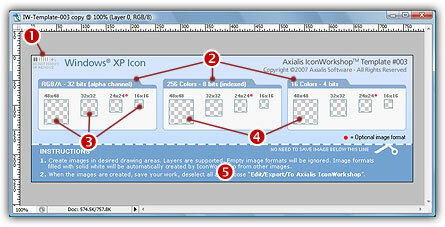 • How do the Photoshop templates work? In this tutorial, we'll create 2 icons using Photoshop templates. 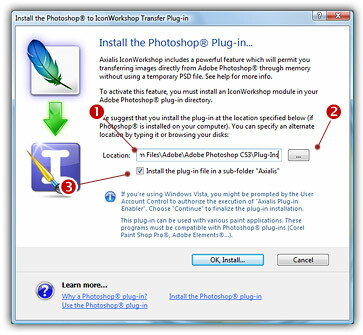 Templates permit you to use the powerful tools of Photoshop to draw your icon in different formats, then transfer the work to IconWorkshop. 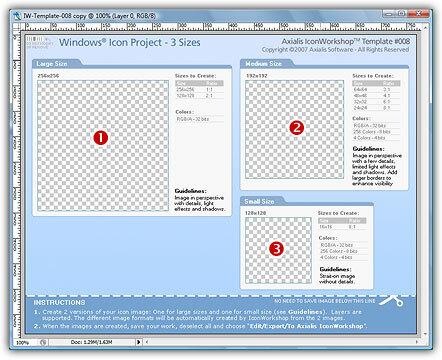 Axialis IconWorkshop creates the icon automatically in one step. How do the Photoshop templates work? Select "new icon project from template" in IconWorkshop. Choose one template (10 templates are provided, see below). Adobe Photoshop is launched and a new image document is created with the template image in background. Draw your images, creating layers as necessary. 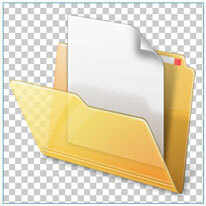 You can save the work as a PSD file for later use. Choose "Export to IconWorkshop". The Axialis plugin is launched, a XML description file is read (you can create your own, see in help) and the icon is created in IconWorkshop. Just retouch it if you want and save it. 5. Now you can start your Photoshop application. 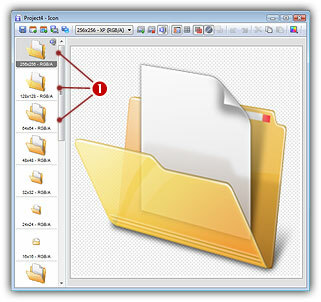 The plug-in is visible in Filter/Axialis/Transfer To IconWorkshop and File/Export/Export to Axialis IconWorkshop menus. Read this for more info on how to use the plug-in filter. In this first part, we'll create a simple icon for Windows XP. To do this, we'll use an "Icon Template". 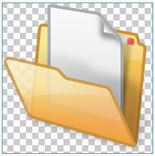 This kind of template (see above), permits you to create each format of the icon separatly. A typical Windows XP icon contains 9 or 12 formats: sizes 48x48, 32x32, 16x16 (optional 24x24), each one in colors RGB/A, 256 and 16. As a result, the templates contains 12 areas where you can draw the different formats of the icon. If a drawing area is left blank, the associated format is not created. 1. First, be sure the Photoshop plug-in has been installed (see previous topic). 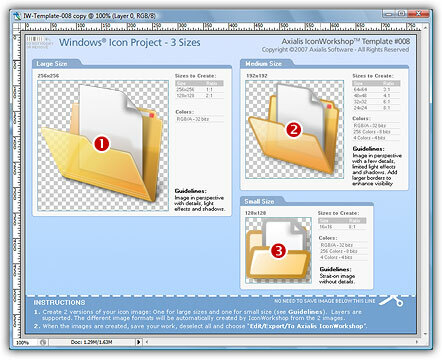 Choose File/New/Icon Project from Photoshop Template/Windows XP Icon (48x48...). 2. Adobe Photoshop opens and a new document is created. Its name is "IW-Template-003 copy". The term "copy" means that this is a new document based on the file "IW-Template-003" but not linked to it. As a result, you won't overwrite the original template image by saving your over it by error (simply by pressing Ctrl+S for instance). It's like a new document containing an image at startup. The figure above shows the document window as it has been created in Photoshop. 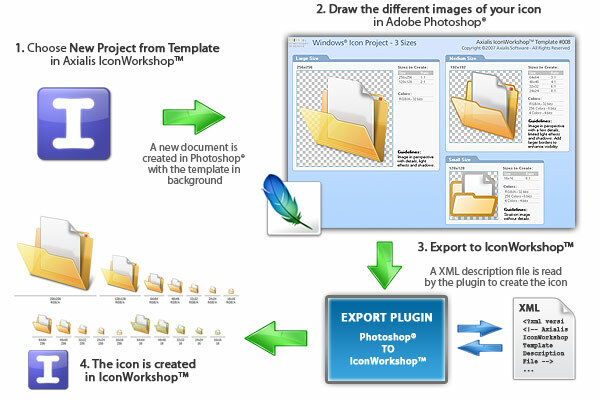 In the upper-left corner ( ) there is a barcode to let IconWorkshop identify the number of the template (this permits IconWorkshop to associate the template image with the associated XML file). Do not modify or remove this barcode. The template is divided in 3 groups ( ), one per color mode. We'll draw image formats only for the RGB/A color mode in sizes 48x48, 32x32 and 16x16 ( ). We'll leave the other formats blank ( ). At the bottom of the template you'll find some instructions on how to use the template ( ). 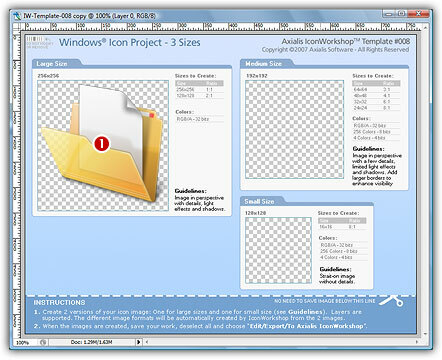 This part of the template is not used during the export into IconWorkshop and the icon creation. If you want to save your icon project as a separate PSD file, you can remove this part (crop the image above the doted line). You can also do this directly from IconWorkshop: in the Librarian, open the folder "Objects\Samples\Medium", right-click on the file "Folder With Document.png". A menu opens, choose "Open With/Adobe Photoshop". The file is opened in a Photoshop document window. This is an advanced method for creating icons but this is the one which produces the most professional results. The final icon contains hi-res images for operating systems which support them such as Windows Vista or MacOS 10.4/10.5. It contains also smaller images which are easily identifiable by the user in all resolutions. In the procedure below, we'll create a fully featured Windows Vista icon of the image "Folder With Document" that we've already used above. 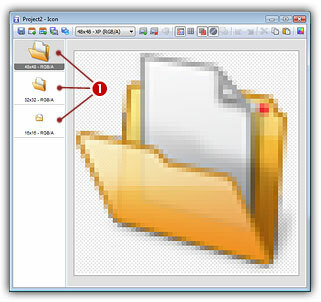 The figure above shows the document window as it has been created in Photoshop. It contains 3 drawing areas where you'll draw the 3 images of your icon: the large size 256x256 ( ), the medium size 192x192 ( ) and the small size 128x128 ( ). You can also do this directly from IconWorkshop: in the Librarian, open the folder "Objects\Samples\Large", right-click on the file "Folder With Document.png". A menu opens, choose "Open With/Adobe Photoshop". The file is opened in a Photoshop document window.